For Fun DR Transportation | Prestige Dominican Realty "It all starts with picking the right agent!" 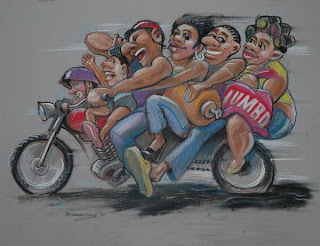 The main means of transportation in the Dominican Republic is the motorbike. Naturally there are cars and trucks and bicycles but most families, especially the poorer ones, will have a motorbike. As well as people using them for their own personal transportation they are also used as taxis, known as motoconchos. This is usually a full time job for the rider, and someone who is doing this is said to be a 'motoconchista' who is 'conchando'. None of these words are in the dictionary. Whan I first arrived here there was no way I was going to use this form of transport. I would never dream of going on a motorbike in the UK, and there was no way I would start now. It took me 24 hours to change my mind. Walking in the hot sun was not very pleasant, and a trip of a mile or so was only around 30 pence. So I started using motoconchos. The first thing you have to learn is now to get on and off. You should always do this from the left, the side away from the exhaust pipe, otherwise you will often end up with nasty burns on your legs. I began by holding on tightly to the driver, slowly learning to hold on a little less tightly, then putting my hands behind me to hold on to the bar behind the passenger seat, and eventually not holding on at all. There appears to be no limit as to the number of people who can be carried on one small bike, and the driver will always help you by carrying your shopping for you. 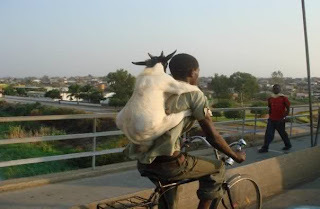 And motoconchos are not only used for carrying people. Whatever you need, whatever you want you can always call a motoconcho to bring it to you. 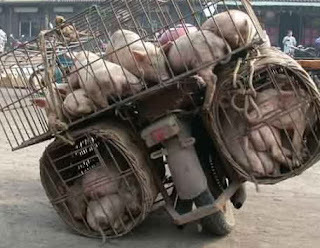 In the streets they ride up and down selling things, such as eggs, bread, ice cream, brushes and pork scratchings. If you need your fridge repaired, just call the motoconcho and he will hoist your fridge onto the back of his bike and take it off for you. The bike are almost always bought on credit, with interest rates at over 100% a year. If the payments are missed at all then the interest becomes even more. Given that the bikes are so necessary for the motoconcho to earn a living, they are always desperate to keep them, and if they don't keep up the payments then the bikes will be repossessed and they will lose all of the money they have paid so far. In order to keep up the payments they will often pawn pieces of the bike such as the instrument panel, the indicators and the lights. Hence it is wise if you take a motoconcho at night to check it has lights. If not, the driver will usually take his mobile phone and hold it in front with one hand so that other drivers on the road will hopefully see a mobile phone twinkling in the distance, and be a tad less likely to hit you. The bikes are not only used for carrying people and household items. They are even more widely used in the rural areas where people are too poor to have a car, and often the roads are not wide enough or suitable for a car either. 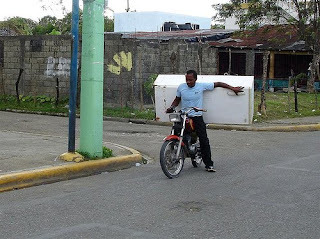 Obviously it is a little more difficult to carry live animals than a dead fridge, but Dominicans always manage to find a way around the problem. It cannot be denied that it is a very dangerous mode of transportation, and hundreds of motorbike riders and their passengers are killed every year. Very few wear helmets and even fewer wear protective clothing. Occasionally the police will try to clamp down on them and arrest them if they are not wearing helmets - once they start doing that those that do not have helmets, which is the majority, will put anything protective on their heads, including saucepans. Motoconchos are a Dominican institution, and you will always see something which will make you smile and wonder at the ingenuity of the local people here.